Many wristwatches that are clearly lady's watches are today described as trench watches. The term is being used to describe a type of watch, one with fixed wire lugs, and not necessarily one that was actually used, or even likely to be used, in the trenches. This may be due to ignorance, or even deliberately, but in the majority of cases I think it is because the vendor expects that it will lead to a higher price if someone believes his description. As with anything, caveat emptor: do your own research, look closely at what you are buying, and certainly don't trust a vendor's patter to be always entirely accurate. The section reproduced here is from my page about Great War trench watches. A correspondent posed the question: "There are many so called "Trench Watches" listed on auction sites (not just eBay), that are in reality ladies wristlets. Given that the introduction of the first wristwatches (or Wristlets) were for ladies, which men of that period, considering them something "that real men would not wear", continuing to prefer a pocket watch, how can one tell whether a so called "trench watch" is a man's or a ladies watch?" From eBay: WWI Officers Silver Trench Watch. Really? Anyone who is interested in trench watches will be familiar with this phenomenon. 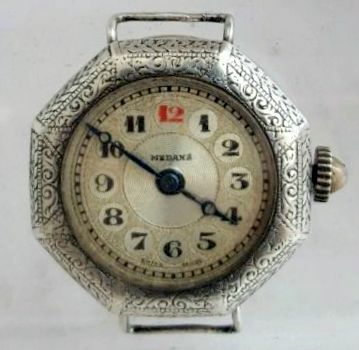 Small watches with fancy dials and cases that no man of the early twentieth century would be seen dead wearing are described as "trench watches" — like the one in the picture here, unbelievably advertised on eBay as a "WWI Officers Silver Trench Watch". The listing accurately describes the watch as having a 30mm diameter silver case with Art Nouveau decoration, the dial having black Roman numerals and red 12 with gold dot markers between the numbers. The listing said "I think because of the quality the watch was an Officers dress watch." I do not agree with this statement, no male officer of the Great War would be seen wearing a wristwatch like this, it is clearly a lady's wristwatch. At the time of the Great War there was still a lot of resistance to a man wearing a wristwatch at all because it was thought effeminate, and no man would want to add to that impression by wearing a wristwatch that was clearly feminine in appearance. A man's wristwatch, whether he was an officer, other ranks or a civilian, would be plain, functional and manly in appearance. From eBay: Medana military trench office watch c1930. Really? I don't want to pepper this page with examples of misdescribed lady's wristwatches but here is another one that caught my eye. The listing calls it a "Medana military trench office [sic] watch c1930" and describes it as a "... solid silver medana military trench watch" with case diameter 27mm (approx ). It is certainly a Medana watch, the dial says so, and the snap back case is solid silver, it carries Birmingham hallmarks for 1923/1924. It also has a pretty low grade cylinder movement with just one jewel. I wrote to another eBay vendor who was advertising a "Solid 9ct Gold Ladies Trench (1912) Watch" (emphasis added). I said "Why do you call this a "ladies" trench watch? There were no ladies in the trenches. This is a lady's wristwatch or cocktail watch, and you are more likely to get a good price if you title and describe it as such because people like me searching for trench watches aren't looking for ladies watches, and ladies looking for wristwatches or cocktail watches won't be looking for trench watches." The vendor replied "Good point David and strictly correct, however, WW1 has become such a well documented period over the last year that the 'trench' metaphor has sunk into the public's mind. Sadly, most people don't understand the meaning of a 'cocktail watch' and I therefore use the 'trench' word loosely to denote a watch from that period." Needless to say, I don't agree with the reasoning here. I think that most people know about the Great War, and do understand the difference between a man's trench watch and a ladies' wristwatch or cocktail watch. There is also a tendency on eBay for vendors to list watches as "Gent's trench watch ..." or "Man's ..." or "Officer's ..." when they are clearly nothing of the sort. I think they most likely know perfectly well that the watch is nothing of the sort and is in fact a lady's watch, but it could be simple ignorance and they don't know any better. The possessive apostrophe is usually also missing because they don't know punctuation either. Trench watches have wire lugs, and unfortunately today any wristwatch with wire lugs tends to get called a trench watch. This is probably because the vendor knows that early man's wristwatches from the Great War era are very collectable, whereas there is virtually no market at all for early ladies wristwatches. However, wristwatches with wire lugs were made for ladies long before they became popular with men, but there were no ladies in the trenches and ladies' wire lug wristwatches should not be called "trench watches", a term I would prefer to keep for wristwatches that were, or at least might have been, worn by men in the front line trenches. But how can such wristwatches of essentially the same style be distinguished? My reply to my initial correspondent was: I think it is a like men's and ladies' shorts — I mean clothes not drinks — the difference is in both the size and the style. My grandfather's and grandmother's Rolex wristwatches. My grandfather's watch is on one of my Type B straps. If you click on the picture you should get an enlarged view. Men's shorts and wristwatches were larger and more manly looking, ladies' shorts and wristwatches smaller and more feminine. In the early twentieth century dress codes and fashion were much more restricted than they are today, and men would avoid at all cost wearing anything that might look in any way feminine. This was the main reason that men resisted wearing wristwatches at all until the Great War made a wristwatch a necessary item of an officer's kit and thereby legitimised the wearing of them by men in general. 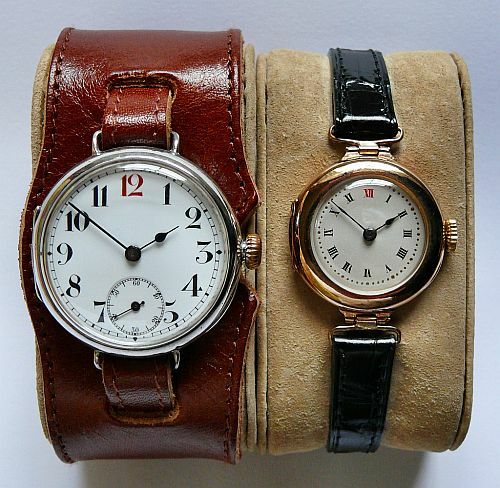 Take for instance the picture of my grandparents wristwatches shown here, both made during the time of the Great War. I am sure I don't need to tell you which is which. My grandfather's wristwatch is larger than my grandmother's at 34mm diameter versus 28mm, but it is also clearly plainer in style and therefore more acceptable to a man. Also note that whereas my grandfather's watch has "wire lugs" — loops of wire soldered to the case to hold it onto the strap — my grandmother's watch has a different way of attaching the strap. This watch was originally fitted with an expanding metal bracelet. The attachment to the case takes the form of lugs soldered close together on the case, with a pin or bar spanning the small gap between them. This is how the bracelet was attached. This becomes a problem when the bracelet wears out and a replacement is not available. It is impossible to fit a leather strap directly to the small pin between the lugs. If you want to attach a leather strap to a watch like this, see Loop Ends. To attach a leather strap to a ladies watch like this, a ‘loop end’ or ‘jointed loop’ is attached to the case. 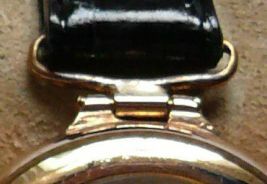 The loop end can swing about the pin; in watchcase making terms, a joint is type of hinge like this hence the name jointed loop. If you see a watch with loop end strap attachments like this, then you know straight away that is a lady's watch. However, a small watch with a fancy dial is still a ladies' watch even if it has wire lugs like a man's watch. Note that both my grandfather's and grandmother's wristwatches have a "red 12". Some people think that a red 12 automatically indicates a military watch but this is not the case, both ladies' and men's wristwatches commonly had red or blue 12s in the early days of the wristwatch. See my page about this at Red and blue 12s. I regard any wire lug wristwatch with a case smaller than 32mm as rather small for a man's watch, and certainly anything smaller than 30mm diameter as a de-facto ladies wristwatch (case diameter excluding the strap lugs and winding crown). My wrist measures about 185mm around, and I feel comfortable wearing a 35mm case diameter wristwatch, even down to 33mm diameter. But less than this I think looks too small for me. Often the size of the watch is not quoted in an advertisement, because a small size is a dead give away that it is a ladies' watch. The size is the diameter of the case excluding the crown (winder) and strap attachment lugs. This is more important than it might seem, because the overall area of the watch face, which is what creates the impression of size (or lack of it) is determined by the square of the diameter. An extra millimeter on diameter adds area all around the circumference, which makes a big visual difference. I sometimes get people who have bought a small watch ask me to make up a strap with a wide back pad to ‘make the watch look bigger’. This doesn't work; a small watch on a big back pad looks exactly like what it is, and it doesn't look right. Plain small wristwatch 27.4mm diameter. A plain lady's watch, or a small man's watch? 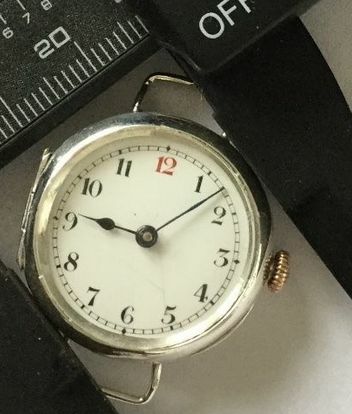 I had a correspondent swear to me that a 28mm wire lug wristwatch belonged to their grandfather, and that he wore it when he was in the army during the Great War. During the Great War the army found that many men called up were below regulation height and unfit for service due to a poor diet. It is entirely possible that a man of small stature with a small wrist chose a ladies' size wristwatch. The watch in question was plain without any feminine embellishments, and on on small man would not have attracted any adverse comments. Any man choosing a wristwatch would have avoided anything that might look feminine. It is true that plain looking watches were made in this size; one is pictured here that was advertised on eBay as a "Pre-WW1 Trench Watch", which is in itself a bit of nonsense. This particuIar watch is has a case diameter just over 27mm and a cylinder escapement. I am sure that watches like this were intended for ladies who preferred a plain rather than fancy look, but of course there was nothing to stop a man buying one. Gold watches are on average smaller than silver watches, presumably on account of the cost of the gold used to make the case. I have not done a survey to establish whether this is generally true (which would be difficult because so many gold cases have been scrapped over the years) it is just an off-the-cuff observation based on the examples I have seen. But I still think that even gold watches from the Great War period that are smaller than 30mm are ladies' watches. A vendor listed on ebay a "Solid 9K gold trench type watch, 29mm case", saying that this was "described at the time as gents medium". I asked if he had any evidence for this, and of course he didn't, saying only that "men's wrist watches were generally smaller than now, large were 30+ mm" and citing watches listed on ebay as evidence of this. Needless to say I don't agree with his circular reasoning; things on ebay are described in a way that the vendor thinks will get the best price, not necessarily because that is what they really are. My collection of Great War wristwatches and analysis of period adverts for "Service" watches indicates that a typical man's wristwatch had a 13 ligne movement and a case size of around 35mm. Some wristwatches were slightly smaller than this, using 12 ligne movements and 32mm or 33mm cases, but 35mm was the "medium" case size, below which Great War era wristwatches are "smaller" and above which they are "larger" than average. My rule-of-thumb about men's wristwatches having a greater than 32mm case size during the Great War does not apply to watches made later. During the the 1930s the size of men's watches unquestionably decreased. Many watches from this period that are undoubtedly men's watches are 30mm diameter, and even sometimes a bit less. This was partly watchmakers showing off, making small watches that were still good timekeepers. But there was little point in making them if they were not going to be purchased, which they obviously were. However, men's watch still looked like men's watches, plain and simple rather than dainty or fancy. I think the fashion for small watches was a reaction to the austerity of the times during the great depression, giving rise to a desire not to be seen to be flash or ostentatious. It was also the time that stainless steel came into fashion for watch cases for the same reasons. Any wire lug wristwatch with a "fancy" dial - e.g. a silver dial with fancy guilloché engine turned patterns, gold numbers, especially gold dots for the minute track or between the numbers, jewels etc. also identifies a lady's watch. Today I see men wearing earrings and although I wouldn't do it personally, I can't make a rule that says it doesn't happen. But even today I don't see men wearing small fancy wristwatches, and at the time of the Great War a man choosing a wristwatch to wear in the trenches would have avoided anything that looked at all feminine. Note that this doesn't apply the other way round. It was certainly fashionable for ladies to wear watches that looked like men's watches with luminous dials. This has often been the case; remember the fashion for ladies to wear camouflage print clothes and shoes during the Gulf War. Remember also that military men demanded certain features. Commenting on the wristwatches that were officially issued in 1917 Wesolowski says All the wristlets ... have ... Swiss 15 jewel lever movements, ... black enamel dials and radium numerals and hands. The reference to "radium numerals and hands" means that the numbers on the dial and the hands were painted with a radium based luminous paint that glowed brightly in the dark - in fact it glowed brightly all the time, you just couldn't see it in daylight. The strength of the glow from this new fangled and mysterious luminous paint was one of the things that made wristwatches in particular so appealing to young men at the time, they were the smart phone or Apple watch of their day. 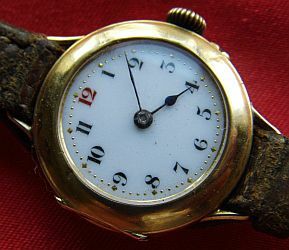 Although the officially issued wristwatches may have all had black dials, this was not the case for trench watches that were private purchases and the vast majority of trench watches had white enamel dials. But in the main those purchased during the Great War as "service watches" had luminous dials; skeleton hands and numerals carrying luminous radium paint. The radium luminous paint had a fairly short life, some sources say as little as three to four years. This was because the fluorescent compound was burned out by the radiation from the radium. The radium however remains radioactive for thousands of years and still needs to be treated with caution - see my page about this at Luminous Radium Paint. In "Knowledge for war: Every officer's handbook for the front" by Captain B. C. Lake of the King's Own Scottish Borderers included a list of Officer's Kit for the Front. The first item on the list, ahead of otherwise indispensable items such as "Revolver" and "Field glasses" is "Luminous wristwatch with unbreakable glass". Every advert for watches aimed at men preparing to go to the front, such as the advert pictured earlier on this page by The Goldsmiths & Silversmiths Company, J C Vickery and Mappin & Webb, emphasised the luminous features of the watch. So an easy way to identify a "true" trench watch is by skeleton numbers and hands intended to take the radium paint, even if that paint has been removed or no longer glows in the dark. 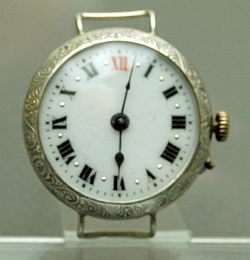 There is no question that watches with plain numerals and hands were used at the front and in the trenches, but whether a particular watch with plain numerals and hands was so used is less evident from its appearance and one has to fall back on inference from date and any provenance. Often it is simply impossible to say. From eBay: "Ladies trench watch"
So in answer to the question: there is no definitive rule or way of telling whether a particular wristwatch is or was a man's or ladies watch. My personal rule is that "I know it when I see it" based on size and appearance. For some wristwatches with wire lugs — 35mm diameter with skeleton numerals and hands for luminous paint — there is really no question that it's a man's watch. And this is also true for ladies wire lug watches such as the 30mm diameter fancy Art Nouveau watch with gold dot markers between the numbers pictured above; this is clearly a ladies watch. But for intermediate sizes around 30-32mm with plain dials the answer is not so apparent and a judgement based on common sense is called for. Many wristwatches that are clearly ladies watches are today described as trench watches. Collectors have to accept this as an annoyance: the term is being used to describe a type of watch, one with fixed wire lugs, and not necessarily one that was actually used, or even likely to be used, in the trenches. This may be due to ignorance, or even deliberately as in the case of the "Solid 9ct Gold Ladies Trench (1912) Watch" I mentioned, which although wrong in my view is at least not attempting to be misleading. 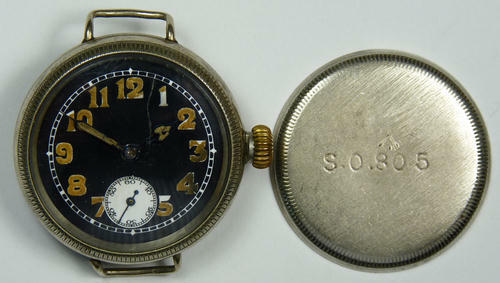 In the many cases the mis-description is deliberate, such as the "Antique gents WW1 trench watch" shown here. This pretty little 18 carat gold wristwatch, "30mm with winder", i.e. case about 28mm diameter, is clearly a ladies wristwatch. No man of the Great War would feel emboldened going "over the top" wearing a watch like this. I am sure that the reason this is described as a gents WW1 trench watch is because the vendor expects that it will lead to a higher price if some poor soul believes it. As with anything, caveat emptor: do your own research, look closely at what you are buying, and certainly don't trust a vendor's patter to be always entirely accurate.